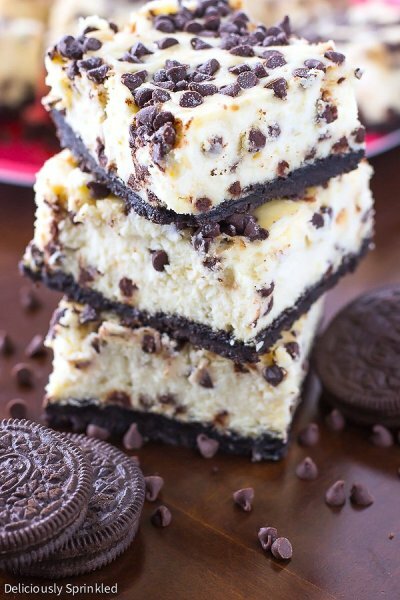 In my opinion, it doesn’t get much better then these simple Chocolate Chip Oreo Cheesecake Bars. These cheesecake bars have a thick, sturdy, Oreo crust, which I love. There is nothing worse than cheesecake bars with a thin, soggy crust. On top of the Oreo crust, is a smooth, creamy cheesecake that is loaded with mini chocolate chips. PRE-STEP: Preheat oven to 300F degrees. Line a 9 x 9 inch baking pan with aluminum foil, leaving enough overhang on the sides. Spray with non-stick cooking spray. Set aside. STEP 1: Using a food processor, pulse Oreo cookies and butter together until crumbly. STEP 2: Press cookie crumbs onto bottom of prepared pan. Set aside. STEP 3: Using an electric or stand mixer, beat cream cheese until light and fluffy. STEP 4: Add condensed milk and beat until smooth. STEP 5: Add eggs and vanilla extract. Mix well. STEP 6: In a small bowl, coat 1/2 cup of mini chocolate chips in the flour. Mix coated mini chocolate chips into cream cheese mixture. STEP 7: Pour cream cheese mixture into baking pan. Sprinkle the remaining (non-coated) mini chocolate chips on top of cream cheese mixture. STEP 8: Bake for 1 hour or until cheesecake springs back when touched. Let cool at room temperature. Chill in fridge for at LEAST 1 hour before cutting into squares. * Store cheesecake bars in a covered container for up to 7 days in the refrigerator. Cheesecake bars can also be frozen up to 2-3 months. Thaw overnight in the refrigerator before serving.